Slices of the second day of school. But today I have slices. Slices that remind me why I love teaching. Let me zoom in on one my favorite questions. Student A: Vote for me. I’m going to make this classroom great again! Student B: Hey! This classroom is already great! Then in writing we did some quick 6 word memoirs, and that’s when I truly remembered how much I love my job. Start slow. Take breaths. Work hard. When kids needed a break. that let them pretend they were learning vocabulary. that starts over every August. I’m sitting at my (messy) dining room table, with an empty writer’s notebook in front of me. I’ve decided that typing a slice might be more productive. Before that, I got home from a short dog walk, shortened because something about seeing a police car hanging out around the block made me get uncomfortable in the dark. I’m easily scared of the dark. The police officer in the car looked friendly and happy. It’s not her, it’s me. Before that, the dog peed on the rug. Before that, I was working on random to do list items but without the actual to do list. I was entering students into my classroom library database, and replying to parent emails, and thinking about how I should make an actual to do list. Before that, the whole family took a year and a half to decide that we should just order pizza for dinner. Before that, I tried to get L to put ice on her head because she was hit in the head with a basketball. Before that, I was briefly sitting on the porch with E, listening to the sounds of happy basketball playing. Before that, I was dropping my bags, and taking off my shoes, drinking water, and hugging my kids. Before that, I was finally leaving school, with information overload, and too much left to do. Before that, I was creating class lists, locker lists, labels, maps and presentations for back to school night. Before that, I was on a tipping ladder, realizing one of the legs was up on the edge of a carpet. Before that, I was on the floor picking up a hundred magnetic words. Before that, I was on a ladder, re-positioning a giant question mark, when it suddenly fell and knocked everything off of the top of my bookshelf. Before that, I was gluing signs. Before that, I was in a meeting. Before that, I was in a lunch meeting. Before that, I was picking up friends to drive to our opening day meeting. Before that, I was hurriedly throwing bags in my car, giving giant hugs and watching sad children as I drove away. Before that I was rushing around wishing I hadn’t turned my first alarm off. Before that, it was still summer. The Giant Question Mark, the glued signs…. Yesterday someone referred to August as Summer’s Sunday. I’m not so good at Sundays. They are simultaneously the day I have finally relaxed into my weekend, and the day I remember all of the things I need to do for the week ahead. “There’s not enough time!” is my accidental mantra every August. In the car, driving L to camp – over the mountain into the woods, she asked me if I had noticed the trees lining the road into the campus. “They are such narrow trees, but such a thick forest.” She told me. I hadn’t noticed. Yesterday picking her up from camp, I had noticed the tight one lane driveway, the way I had to pull over to let other cars through. I had noticed the forest, the way the light changed enough to make me take off my sunglasses. I hadn’t noticed the interesting way the small thin trees stood close and thick and created the dappled light. I guess I couldn’t see the trees for the forest. This must mean something. 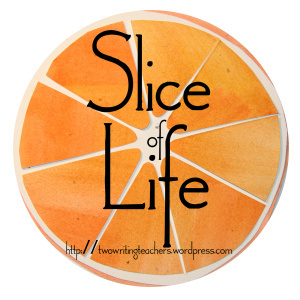 So this morning, I noticed the trees in the forest, and decided I was so glad it was Tuesday… a day to notice slices. I took the boys school shopping while L was at camp. I want to package up these little kids — resistant school shoppers who ended up really getting into picking their own clothes. One day they’ll be borrowing my car, I guess… and running to the store to get their own stuff. I tear up just typing that. That is the day I want to pull out my package of slices. I want to laugh about H taking matters into his own hands to find a quarter for him and one for his brother, after I told them I didn’t think I had any. I want to remember their little selves, standing in fresh button down shirts off the clearance rack. Even easier slices this evening at a local dam. I live in the same town I used to live in as a child. We moved away after fourth grade. Perhaps because I didn’t live here for a decade or so, I often feel like I’m time traveling when I watch my kids in the same places I went to when I was their age. A slice: The drive up and down the mountain roads to the dam…turning off into a thickly wooded gravel road. The bumping of the car and the beauty of the woods just out of reach because your head starts to hurt from the sunlight popping in and out of the trees — just enough to make your eyes squint. A slice: The view. I stood in the dam, tried to quiet my anxieties about water and kids, wished I had my camera, and just focused on the view. Dark rippled water, the swimming section roped off, with more water beyond. Trees everywhere, and a blue sky meeting a mountain on the horizon. I wanted to take a picture, but forced myself to stay in the water just being there instead of walking to my car to grab my phone. Instead I begged L to take a mental picture so she can paint me this scene one day soon. It’s too much, these slices of time travel. I know I’ve gone too far into nostalgia when I start to wonder if the sand I’m standing on is the same exact sand I stood on 30 years ago. “This is the same place I went to when I was a kid!” I tell Lilian – excited to see nostalgic things come full circle. “Great.” She says, eyebrows raised in only the way a 13 year old can do it. Apparently she isn’t pre-nostalgic for her own childhood quite yet. Thank goodness. I think that means that we are still in the forest of her childhood.